One day not too long ago, my older daughter asked if I wanted some buffalo wool…?!? Of course, I answered YES before I bothered asking for any more information, but then I wanted to know how she was able to get it for me! As it turns out, she happened to be on FaceBook at just the moment that a mutual acquaintance / fellow rabbit breeder offered 13 one-gallon bags of buffalo wool to anyone who could use it. 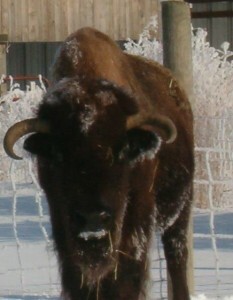 She lives on a ranch, and has been gathering the shed wool for some time from their two buffalo (American bison) cows. 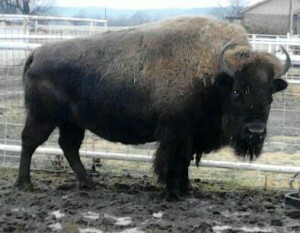 JoAnn said that they bought a buffalo cow and calf shortly after they moved to the ranch, about 13 years ago. She doesn’t know how old “MamaLo” was, but by the time the cow died last year, the old girl had started going grey. She had had a good life, and apparently enjoyed being in charge of the herd of cattle they were pastured with. The calf grew into an intimidating cow, and the name “BabyLo” apparently hasn’t fit her for some time! JoAnn says “…we call her Miss Cranky Pants, but not to her face”. You can see something of their coats in these pictures, and why they need that fluffy insulation. So the transfer was made at a rabbit show, and I waited patiently to get my hands into the fiber. I haven’t looked through all the bags yet, but so far, it doesn’t look like there is an excessive amount of VM (vegetable matter – hay, dried bits of weeds and grass) or guard hairs. Still, I will go through it all by hand, separating out the fuzzy brown undercoat from the stiff guard hairs and unusable bits. A closeup of the sample may look hairy and prickly, but it is really quite soft! And bouncy and stretchy, too – a section of the yarn that measures 6″ when relaxed stretches to 7 1/2″. A little of this luxury fiber goes a long way, because it is so efficient at retaining heat that even lightweight and loosely-knit items are very warm. So perhaps I’ll make a lace scarf, or some fingerless mitts for indoor wear… actually, there should be enough for several really special items!